This is an artist’s impression of a new giant hovercraft currently undergoing the early stages of development. The pictured version is approximately equal to the size of the SRN4 Mark 2, but with greater capacity. A stretched version with the lower deck given over 100% to cars would more or less match the capacity of the Seacat vessels, but with SRN4 type performance. The craft would also be available in a fully passenger version without the bow and stern doors fitted. The theoretical capacity of such a craft would be about 600 passengers, but in practice only about 450 seats would actually be fitted in order to allow a more luxurious interior environment. Noise levels would be considerably lower than for the SRN4. The actual choice of powerplant has yet to be made, but it is hoped that [with the use of active noise suppression systems] the total noise level would be about 20% of that of the SRN4. Operating costs should be approximately 50% of those of the SRN4. The cockpit is designed for two man operation, but would be much larger thanon the SRN4. The intention is to fit at least three observers seats in order to expedite training. The cockpit is shaped to follow the contours of the superstructure in order to reduce drag, but would still allow all round vision – it is actually set higher than the upper deck, although this is difficult to see in the painting.Once certain key decisions have been made regarding vital design aspects, this will allow work to speed up somewhat. Passenger windows are set back further than on the SRN4 in order to reduce the problem of spray on the windows spoiling the view. Indeed, for the upper deck at least there should be no spray problem. 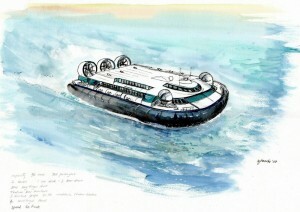 The people behind this project are in contact with a number of tentative schemes round the world which would involve hovercraft services that would require craft of this size, and based on these initial contacts, a very rough estimate is that an initial production run would consist of between 15 and 20 craft. Assuming this works out in such a way that concurrent orders can be placed for the craft, then it is hoped that the cost of each craft would be around £80m Sterling for the version illustrated, and about £100m Sterling for the stretched version. any progress with the new craft will be detailed on Hover-Gen as and when possible. The current state is that the basic design has been worked out, but much detail remains to be sorted. General hull layout design done. General arrangement more or less known. Exact choice of engines and transmission. Exact construction method for superstructure. Construction of a full sized cockpit mock up to aid design and layout. Construction of a 1:20 scale radio controlled test and development model. Additional updates will be made in due course, but it is impossible to predict the timing of such announcements. However, it can be said that the 1:20 scale model would be of a 65m long craft as this version has the greater sales potential. In the document below, which describes the NGH in great detail, please note that some details have been blanked out for reasons of commercial confidentiality and in some cases to protect the privacy of various individuals. This is an edited version of a much larger internal NGH document. 1.1 It is my personal belief that, far from being over, giant hovercraft will have a vital role to play in the future of transportation. 1.2 The reasons for this are the speed, flexibility, ease of operating and environment friendliness of hovercraft compared to conventional vessels and catamaran craft. 1.3 Giant hovercraft development stagnated after the Mk3 version of the SRN4 was produced. As a result, the public and operational perception of such craft is that they are noisy and expensive with high fuel consumption. However, such factors are not necessarily true. Developments with smaller diesel powered craft [ in particular the AP1-88 and the Griffon range of craft ] up to 100 seats in size prove this. These latter craft have generally replaced the unacceptably noisy SRN6 type. The challenge is to create a craft that can do the same from the SRN4 size of hovercraft. The craft must at least equal the payload capacity of catamaran craft. The craft must match or lower the operating costs of catamaran craft. The craft must have a much lower noise output than the SRN4. The craft should equal the SRN4 performance envelope. The craft should be capable of being produced at a lower cost than an SRN4 type. The design of the craft should offer many versions within the same basic bodyshell. The craft should be mechanically and operationally simple compared to the SRN4. The turnaround time should match that of the SRN4s despite the greater capacity. These straightforward requirements are essential if the NGH is to be a commercial success. 1.5 It is also the intention that while the most up to date technology will be used, it will be technology that is tried and tested and known to be reliable rather than risk delays and bad publicity by installing totally new technology. Similarly, it is intended to avoid using technology for it€™s own sake; it must have a justifiable purpose. 2.1.1 From considering all the requirements, a basic design was created. From the very start, the need to cope with sea conditions equal to those faced by the SRN4s straight away dictated a craft of at least the same size, even before taking capacity into account. 2.1.2 The need to match the capacity of catamaran craft results in a craft larger than the SRN4, but to keep the size reasonable it becomes necessary to use a double deck design. The basic craft dimensions are 65m long and 30 to 35m wide [ compared to 56m and 28m respectively for the SRN4 Mk3 ]. 2.1.4 The craft is not an integrated design in order to eliminate the need for the right angled lift / thrust splitter gearboxes, which were always a source of problems on the SRN4s. A non-integrated craft requires more engines, but the engines can then each be smaller, allowing greater flexibility in the design and a higher level of redundancy in the event of failure. It also allows fully independent individual control of each lift fan and propulsion fan. A larger number of smaller engines also means the engines can be run below their maximum setting, which reduces wear and tear while also providing a huge reserve of power for emergencies. Note than in the gas turbine electric version [ see below ] a smaller number of more powerful engines are used, but the principles are the same ]. 2.2.1 The engines would generally be diesel, however a gas turbine version would also be available. Both types have advantages and disadvantages. 2.2.2 Gas turbines are relatively small and have a very high power to weight ratio. They are also cleaner to operate than diesel and have a generally higher level of reliability. The main disadvantages are the high initial cost of the engines and the specialist maintenance knowledge required. In particular, special attention is required to engine cleanliness if used in a salt water environment; this is very labour intensive. For operations in a fresh water environment, however, the latter becomes irrelevant as a factor as the engines would, in fact, tend to keep themselves clean. 2.2.3 In the gas turbine version of the NGH, the proposal is to use four engines mounted under the external running boards, but instead of a conventional drive system, an electrical transmission will be investigated. This would operate in a similar way to a diesel electric system in that the engines will drive generators, which will in turn supply power to motors controlling the lift and thrust fans. 2.2.4 It is anticipated that although the generators would be relatively heavy, the lower weight of the gas turbines would mean that overall the weight should be no greater for the four engines gas turbine electric version than for the ten engines diesel version with mechanical drive described later. 2.2.5 The gas turbine electric drive would still allow the NGH to be a non-integrated design of craft as each motor would be controlled individually. This means the performance enhancements suggested [ see later ] from fine individual control of each lift fan fully independently from the thrust power would still be present. 2.2.6 With four engines, the aim would be to obtain the required power from three engines only. Under normal conditions, the engines would be run at a reduced power setting in order to reduce wear and tear on them, and thereby keep the maintenance costs down by extending the life of the components [ this is the same principle behind the provision of four engines instead of two on the relatively small BAe 146 airliner ]. 2.2.7 In the event of an engine failure there would be no loss of craft performance as the remaining three engines would, on maximum continuous rating, provide the full power required. A double engine failure is unlikely, but the craft would still be able to proceed albeit at a reduced speed and lift. 2.2.8 Diesel engines are much cheaper to purchase than gas turbines and also do not require specialist maintenance knowledge. Most mechanics anywhere in the world will understand a diesel engine, whereas relatively few outside the airline industry or the military will be familiar with gas turbines. For operation in a salt water environment, gas turbines also require an extensive daily servicing routine involving engine wash outs on account of the adverse effects of salt on their components. To emphasise the effort involved in this, it should be pointed out that the SRN4s required a daily wash out at the close of service and the Royal Navy has to wash out their helicopter engines after every flight. In both cases this is despite efforts being made to prevent direct spray ingress. The main problem is that the low atmosphere itself above the sea contains fine salt that cannot be effectively filtered out. 2.2.9 A further advantage of diesel is that the fuel is a lot less volatile than kerosene €“ this not only improves safety but should also allow lower insurance premiums. Diesel fuel is also usually cheaper than aviation fuel, though this will very much depend on the tax regime in the operating area and on whether any industrial use concessions are available on either fuel. In the UK, for example, marine diesel is supplied under the €œred diesel€ tax regime. At the time of calculation [ December 2004 ] the approximate cost of red diesel is 30p / litre compared to 90p / litre for the public fuel supply. Obviously these figures are constantly changing and at some point this paragraph will be updated. 2.2.11 Fuel consumption at maximum continuous rating is about 280 grams per kilowatt / hour. Working this out as a conversion from the hp quoted [ 1000 hp = 746 Kw ] each engine produces 1424 Kw at continuous rating and will therefore consume 398.72 kg of fuel per hour. This means total fuel consumption appears at first glance to be 3.987 tonnes of diesel per hour, but it must be borne in mind that for the majority of the time the engines will not be producing full power. 2.2.12 As an example, at the quoted consumption rate and using the December 2004 red diesel price in the UK, a 30 minute long Dover to Calais crossing would use roughly 2000kg of fuel at a cost of roughly £650 Sterling. 2.2.13 The continuous rating quoted is the normal operational maximum power [ the maximum rating, as with other types of engine, is only available for short periods of time ]. The intention is to run the engines at a slightly lower setting, which means the fuel consumption rate would be somewhat reduced. This would not adversely affect the performance of the craft; the power to weight ratio of the NGH would still be higher than that of the SRN4. The normal continuous rating would, of course, still be available as a power reserve [ for example in the event of one of the engines failing ] and as a result it should in theory be very rare to have to use the engines on maximum rating. 2.2.14 Another factor to take into account when looking at the fuel consumption is that the NGH will travel at just over twice the speed of a catamaran. So to use just under 4 tonnes of fuel an hour in the NGH is equal to using roughly 1.5 tonnes an hour in a catamaran. When the greater passenger / car carrying capacity is taken into account, the seat / mile costs of the NGH would compare very favourably with other modes of fast ferry. Bear in mind also that one NGH can do the work of two catamarans, so a smaller fleet size is practical; the fuel costs are not the only part of the equation. 2.2.15 This engine type is remarkably light and compact for a diesel of such power, however before a final choice is made it is intended to research the current market again as this provisional selection was made some years ago in Autumn 2001 and it is therefore quite possible that in the intervening time an even lighter and more compact unit of equivalent power with even lower fuel consumption may have been developed somewhere. ( Since this was written, this prediction has been proved correct; more economic engines are indeed now available and this document will be updated in due course ). 2.3.2 With NGH, there would be four lift fans, two on each side, at either one quarter and three quarters length, or at one third and two thirds length €“ the exact position choice will depend on the results of tests. Like with the AP1-88, the lift fan engines would be mounted under the external running boards and would not encroach on the cabin area. 2.3.3 For propulsion there would be three ducted fans at the rear. This €“ for the diesel version – requires three engine bays, which would be arranged at the rear corners and one in the centre. There would be two car exit ramps positioned between the engine bays, each ramp would be wide enough to unload two cars at a time, thus allowing four cars at a time to be unloaded. The central engine bay could also double up as a key structural component for mounting the upper deck, as would the inner walls of the outer bays. However, no accommodation would be installed above the engine bays. 2.3.4 The thrust engines could therefore be either three larger ones or six [ mounted in pairs ] of the same type as the lift fan engines. The choice is to use six engines in pairs on the grounds that this allows only one type of engine to be used, which keeps the maintenance costs down, and also means that an engine failure would not result in the total loss of thrust from any fan. 2.3.5 It should be noted, however, that as the gas turbine electric version would have no need for these engine bays [ the engines all being under the external running boards ], the gas turbine version would require a different frame structure in this area. In order to avoid having to create two versions of the structure, it is proposed that for the diesel version the walls of the engine rooms should in fact not be structural, but serve a partition only purpose, while the rear superstructure would be supported with the same frames design as for the gas turbine electric version. 2.3.6 There are interesting possibilities for development with the non-integrated power arrangement. As most modern diesel engines are computer controlled the possibility exists to link this software to the craft€™s controls to allow an automatic reduction in the lift on the inside of a turn. This would allow the craft to tilt into a turn, which should allow it to maintain a constant speed while turning and at the same time enable the turn to be made more responsive. This would work in broadly the same way as a tilting train works and should allow a reduction in journey times on sectors that involve non-linear travel, such as along a major river. 2.3.7 In a similar vein, it should be possible to reduce lift on the rear of the craft during acceleration in order to allow power to be applied more quickly from a standing start without suffering the tendency of hovercraft to tip forwards under such conditions. Again, this would be of great value in sectors where it is not possible to travel in a straight line. 2.3.8 In the case of the gas turbine electric version, exactly the same would apply except that it would be the electric motors rather than the actual engines which would be linked to the controls. 2.3.9 Manoeuvrability would be further assisted by large duct vents [ similar to those on the AP1-88 ] mounted at the bows of the craft. 2.3.10 At the front, the car loading ramp would be central as on the SRN4s, but would be much wider. It is likely to be in two sections, again each wide enough to load two cars at a time, allowing loading to also be four cars at a time. Greater attention must be paid to sealing the front ramp when closed than with the SRN4s as the NGH will be subject to stricter rules following the Herald of Free Enterprise disaster; indeed I understand that conventional ferries may not now have opening bows at all, although catamaran craft are allowed to on the basis of the greater height above the waterline €“ this exemption should also apply to hovercraft. 2.3.11 The lower deck will need to be high enough to carry coaches and large vans, although not HGVs €“ a single deck only version of the craft could be built for HGVs. 2.3.12 The lower deck will have a wall [ with cross passage doors to link the two sides of the deck ] down the centre running full length; this will support the upper deck, which will be for passenger accommodation only. This wall will continue up to the roof on the upper deck; this is to provide the required structural integrity without the need for excessively massive frames. On the upper deck this wall would not be solid with cross passage doors, it is more likely to be a series of graceful arch structures in order to keep the upper deck as open and airy as possible. 2.3.13 Similarly, even on versions where the lower deck is 100% car carrying, the side windows would be fitted. Apart from reducing construction costs by standardising the bodyshell this will €“ in daylight at least €“ make the car deck a much lighter and more pleasant environment and would facilitate the ability to quickly convert craft from one configuration to another. 2.3.14 Even on single deck HGV versions the lower deck windows would be fitted. A further benefit of doing this is that it would enhance the external appearance of the craft, which makes for good PR. 2.3.15 On single deck only [ HGV ] versions of the craft, obviously, the solid wall would continue full height. 2.3.16 Conversion of the craft from one version to another would be straightforward. On the SRN4, the layout is fixed because the car deck is built to a lower level than the passenger deck and the space under the passenger deck is used as the part of the plenum chamber in which the lift fans are mounted and from which the skirt is inflated. On the NGH the intention is to build the car deck full width at the lower level and use side mounted lift fans [ as on the AP1-88 ] with wider running boards €“ which would probably be required for safety reasons in any case €“ providing the skirt inflation area. This has a further benefit in keeping the windows further back from the spray, which will improve the visibility for lower deck passengers. 2.3.17 The passenger deck, if required on the lower level, would be built above the car deck in a €œfalse floor€ method that would allow the seats to be at the correct height for the windows and which could easily be removed or extended in a matter of hours to offer anything from 100% cars / 0% passengers to 0% cars and 100% passengers on the lower deck according to the requirements of the customer, again without having to use more than one structure. This kind of flexibility would be a major selling point €“ as far as can be ascertained, there are no marine craft available which can be converted literally overnight from one version to another. Indeed, only the €œcombi€ version of the Boeing 747 airliner appears to have such a €œQuick Change€ ability. 2.3.18 The cockpit will be much larger than on the SRN4, despite being designed for a two man crew [ as opposed to three ]. This is to not only create a much more spacious and comfortable working environment for the crew, but also the intention is to install not one but three observer€™s seats in order to improve the crew training regime. This would also allow a much safer staired access as opposed to the steep, narrow ladder used on the SRN4s. 2.3.19 The roof design will take into account lessons learned from the SRN4 and care will be made to avoid creation of areas that would gather standing water while the craft is at rest. 2.4.1 The skirt would almost certainly be a BHC style bag skirt. The hoverheight would be slightly greater than on the SRN4 Mk3; there is little need to increase this because SRN4 operations were limited to Force 8 gales not by the state of the seas encountered but by the strength of the wind. It is therefore reasonable to expect that the NGH would similarly reach an operating limit dictated by the wind speed rather than the wave height. However, if the hoverheight were to increase in proportion to the generally larger size of the craft, then it would probably end up at around 15 feet maximum, with a normal operating height of 12 feet [ the figures for the SRN4 being 12 feet and 9 €“ 10 feet respectively ]. 2.4.2 As the craft would be some 20% larger than the SRN4 Mk3 it is expected that for a comparable sea state and with an equivalent skirt pressure the ride quality would be smoother. 2.4.3 Unlike the SRN4, the sides of the craft will be raked inwards. This will have the dual effect of reducing drag [ and therefore improving the fuel economy ] and keeping the upper deck mass more central, helping with stability by keeping the location of the centre of gravity more centrally stable. 2.4.4 This also has the effect of causing the upper deck windows to be sufficiently far inwards that they should not suffer from having the view obstructed by spray. This will increase the appeal of the craft to the travelling public. 2.4.5 Fuel capacity would be very much determined by the requirements of the individual clients. In general, however, as the fuel tanks could only reasonably be accommodated under the running boards [ as with the SRN4 ] then the possibility exists to use the fuel system to assist with the trim of the craft by means of fuel transfer between tanks. Again, this feature was used on the SRN4 and is relatively simple to include. 2.4.6 Naturally, with both engines and fuel tanks located under the running boards, care will need to be taken to design the fuel system so that any leakage would not get anywhere near the engines. The likelihood is that the engines would be mounted centrally with the fuel tanks at the extremities; this would both enhance the effects of fuel transfer and keep the tanks away from the engines. It also provides space for extra tanks should any clients require particularly long range use of the NGH. Further safety would be built in by ensuring that any fuel leakage would escape underneath the craft while all engine intake and exhaust systems would, of course, be above running board level. As the engines would of necessity be fully enclosed within watertight bays, the overall result is that it should be totally impossible for any fuel leakage to be ignited. Any fuel leakage from the forward part of the system could not escape from under the craft without being mixed into the spray from the skirt at a very dilute level which would eliminate any danger from that means. 3.1 The brief history of the actual project is that having worked out the basic principles on which NGH would depend it would be necessary to create a design around the specifications. With no funding of any kind available, this would have to be done on a spare time volunteer basis. An appeal was therefore made on the Hover-Gen discussion group for interested individuals to get in touch with me with a view to creating a team of volunteers. 3.2 This approach had both pluses and minuses; on the plus side it meant that as all the work was unpaid it would attract only people who genuinely believed in hovercraft and also ensured that costs were at an absolute minimum. However, it also meant that all effort had to be fitted in amongst every other pressure in these people€™s lives. As a result, work could only be done on an €œas and when possible€ basis, and progress was, accordingly, very slow. 3.3 One big boost was that a former member of the BHC staff who was actually involved in building the SRN4s at Cowes volunteered to be the Designer; this individual runs his own small business in ****** designing and building small craft and he has CAD facilities. This individual, **** ******, has therefore been the most important member of the team. Another key person is *** ******, who also runs a small business, this time building small hovercraft. *** is also living in ****** [ by coincidence not far from **** ] and has a great knowledge of construction methods and a number of useful contacts in both politics and business in connection with redundant shipyards which could be possible NGH construction locations. 3.4 A technical college tutor, whose students love hovercraft, was prepared to use his practical classes to build a highly accurate and correctly weighted 1:20 scale model of NGH for use in aerodynamics, stability and handling tests as well as for publicity purposes, but this failed to materialise at the time as it was dependent on his departmental budgets €“ these were themselves seriously delayed by administrative problems relating to student numbers not being known in advance as a result of a serious problem with examination results in the UK at the time. 3.5 At one time the team totalled about half a dozen people working simultaneously. A few years ago, however, a misunderstanding with the main potential client, who was considering funding the development and ultimately aquiring a very substantial fleet, resulted in the project being put into a €œhibernation€ mode as, by that time, most of the work that could reasonably be done on a volunteer basis had been completed. To proceed further would involve formalising the project, which would require full scale funding. 3.6 Although the problem was soon resolved, it was then clear that the economy was not performing as well as it had been and it was mutually decided to leave things on hold until an economic outlook assessment could be made in mid 2005. 3.7 Unfortunately, this client / backer then died; the project was quickly taken under the wing of an American hovercraft factory but this went into liquidation during 2008. The intention now is to develop the craft in-house with the creation of a purpose built factory as and when a firm lead customer is in place. Until such a time, the project is €œhibernated€ in terms of the craft development itself as efforts are being concentrated on finding a lead customer and a factory location. 3.8 Recently, an approach has been made to me by a new potential client who is interested in aquiring at least two large hovercraft for a possible route which would be completely new to hovercraft operation.